I've fallen in love with this little can of wonder, I know this has been blogged about lots but seriously, if you haven't tried this yet, go and get it, it makes life so much easier, I know this might sound crazy based on it's name but you literally just spray a fine mist of this on, rub it in and done, no waiting around for it to dry, no greasy sticky feeling, just lovely moisturised skin that's ready to roll. I got the essential moisture version (or the yellow one, if you're like me) mainly because I liked the scent of this one best but I also get super dry skin so thankfully this is probably the best version for me, the other two versions are Cocoa Radiant and Aloe Fresh. One of the things I was worried about with this is that it would run out really quickly but I've been using mine for over a month and it's still going strong which I'm quite happy with to be honest. One of my other concerns with this is that it does contain Parabens which I'm trying to avoid at the minute and go for more natural beauty products but I think it's down to personal choice really and it's one of the few things I'm using at the minute with them in so I think it should be ok.
Also, this is an absolute god send in the cold weather, normally I skip moisturiser, in favour of getting into my warm pyjamas immediately after getting out of the shower because I'm just too damn cold to wait around for moisturiser to sink in but this means I can spray and go - amazing! 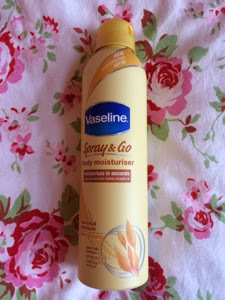 I picked mine up in Boots for £4.99 but it's 3 for 2 across body products at the minute in Boots (I think!!) so get down there if you do want to pick one up.